At the next City Council meeting, citizens will speak out against the resettlement of large numbers of largely un-screened pseudo-refugees from the the Middle East and Central America into Imperial Beach, a suburb of San Diego. This issue has already received some national attention with Gina Loudon’s article published in WND. We have a chance to get much much broader publicity for the, as yet, little-known “Welcoming City” scheme to resettle large numbers of refugees from terrorist and drug cartel areas that cannot be properly screened. Be there early in order sign up to speak, to get a good seat and also there may be a protest before the meeting. A couple thousand local patriots have been e-mailed about this council meeting by various people. Most won’t show up, of course, but a good participation is expected. All are urged to attend to show your support. Take exit #4 west and then turn right on Coronado Ave.
Coronado Ave turns into Imperial Beach Blvd. Last month the leftist, ultra green, mayor of Imperial Beach, Serge Dedina, issued a proclamation declaring Imperial Beach to be a “Welcoming City” a part of Welcoming Communities network. The “Welcoming Communities” program is an Obama initiative intended to resettle large numbers of refugees from Syria, the rest of the Middle East and Latin America in cities and towns across America as part of his “fundamental transformation.” Obama plans to commit us to a huge increase in refugees next year. Between those from the Middle East and Central America it may be as high as a quarter million! A “Welcoming City” proclamation is the first step in the planning process to receive the refugees. This program will also be used to welcome other (read illegal) immigrants. The Mayor’s proclamation was instigated and its approval celebrated by various anti-American, Marxist, radical Chicano and Muslim Brotherhood related groups. It speaks of “legal immigrants,” but IB is policed by the Sheriff’s Department and they are not allowed to check legal status. At the next City Council Meeting, four patriots threw a big wrench in the works, speaking out against the “Welcoming City” declaration. Here is the 25-minute long video of both City Council meetings edited together. The four patriots speak out at about 19:00. The San Diego Reader produced this hit-piece trying to shut down the opposition. A couple of letters to the editor of local publications have also been written. This blogger was requested by one of the participants to help publicize the effort. The patriots of Imperial Beach and their friends are rising up spontaneously against City Hall. There is no single, main organizer of this event. Everyone is invited to help them! Please share this info. Everyone in Southern California has an interest in not inviting more potential terrorists and gang members to resettle here. Don’t let Serge Dedina do to Imperial Beach what Angela Merkel did to Germany! 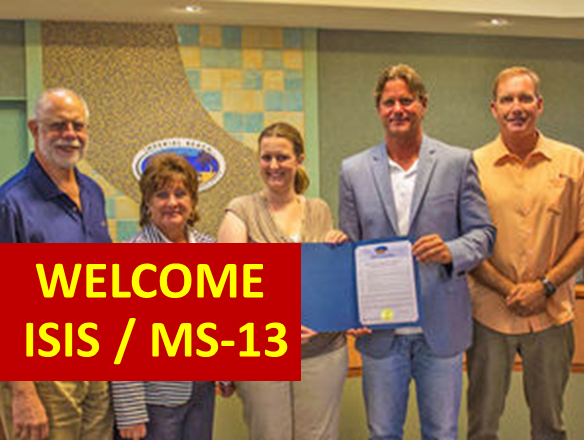 Pingback: Protest ‘Welcoming City’ Proclamation by Imperial Beach, Inviting Refugees to IB | Stop Obama Now!! We could use some support Wed evening. Don’t know what might happen.